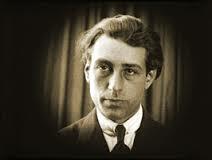 “The films that Abel Gance is best known for, Napoleon, and J’Accuse, maintain their reputation thanks to the many innovative techniques in editing and cinematography employed by their director. Gance’s intention was to make films that audiences could immerse themselves in, and it’s an early experiment with subjective viewpoints that provides the backbone of Dr Tube. It looks as though the film’s entire raison d’etre is as a vehicle for the effects Gance was able to create by filming the action through distorting mirrors. It’s not clear whether the consequent druggy overtones (springing from the highly suspicious idea that the Doctor uses a white powder to alter reality, (…) are intentional or accidental. Some sources report that the producers, on seeing Gance’s completed film, were ‘outraged’ and refused to release it. If true, this would seem to endorse the distinctly trippy qualities of the visuals that the modern viewer can’t help but notice.